Blood cell cancers. 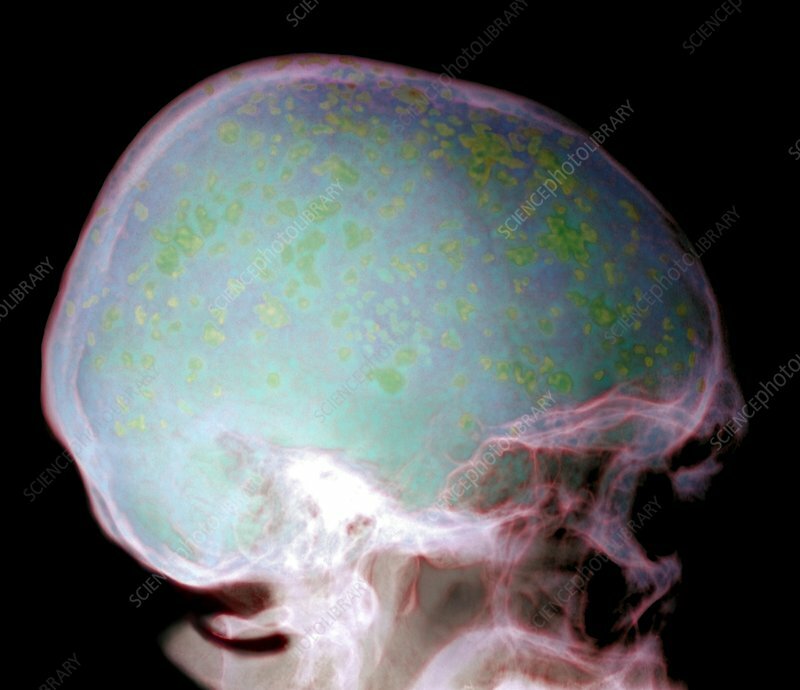 Coloured X-ray of multiple lesions (green) over the skull of a patient who has multiple myeloma, a cancer of blood cells. The lesions are called plasmacytomas. Cancer is the uncontrolled growth of a type of cell. In this case, excess plasma cells are produced in the bone marrow and blood. Plasma cells are a type of blood cell that makes antibodies for the immune system. In multiple myeloma, the excess plasma cells can accumulate to form these plasmacytomas in bone tissue, which weaken the bone. Radiotherapy and chemotherapy can be used to destroy the cancers, followed by a bone marrow transplant.